Investors often overlook airline stocks, preferring the hype of Silicon Valley or a new start-up "disrupting" an entire industry. The airline industry looks downright boring in comparison. But the gains tell a completely different story. The industry seemed too placid for even Warren Buffett, a notoriously conservative investor who seeks out only the thriftiest of value plays. When Buffett made his $10 billion big bet on the airline industry in 2016, buying billion-dollar stakes in the "Big Three" carriers along with Southwest Airlines (NYSE: LUV), market watchers were perplexed. A headline from earlier this year wondered "What Does Buffett See in United Continental and the Airline Industry?" Delta Air Lines Inc. (NYSE: DAL) is up 30% since 2016. Southwest Airlines Inc. (NYSE: LUV) is up 35%. And United Continental Holdings Inc. (NYSE: UAL) is up 103%. The airline industry continues to be a solid buy right now, too. Air travel is surging. A record-high 965 billion passengers flew across the United States last year, and this year is on track to shatter the record with 1.28 billion passengers, according to the FAA. Oil prices have plummeted 33% since October, which should help keep the price of jet fuel – one of every airlines' biggest costs – down. Plus, new technology is making air travel even more efficient. 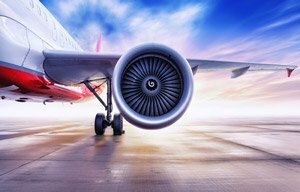 Airlines can now use machine learning algorithms to focus on their most lucrative routes, while newer jets use even less fuel. The new Airbus A350 is now carrying passengers on the world's longest flight, a 19-hour journey from Newark, N.J., to Singapore. That means stocks like Southwest, with a perfect VQScore of 4, continue to be excellent buys. But you don't have to play this industry like Buffett does. You can blow his returns out of the water. An even bigger catalyst is coming to this industry, and only a select few airline stocks will benefit. 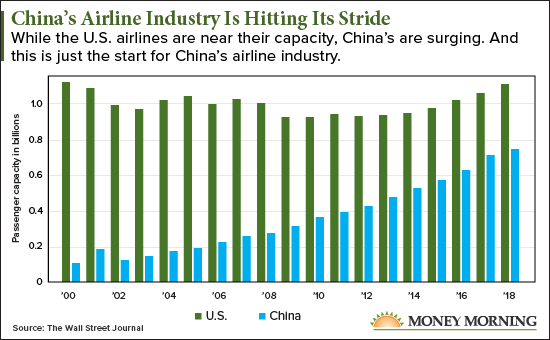 While the U.S. airline industry is seeing record passenger totals, that growth pales in comparison to what's happening in China. The U.S. air passenger capacity is growing at a steady clip, but China's is surging. Between 2007 and 2017 alone, China's airlines handled triple the passenger load. And a slowdown simply isn't in sight. China's air passenger volume is expected to reach 612 million passengers this year, 11% higher than its record-breaking 2017. But with a population of 1.38 billion people and a rapidly growing middle class, air travel will continue to surge in the country. There are currently 430 million people in China's middle class, but that's expected to double in the 2020s, reaching a staggering 780 million. With middle-class consumers being the most likely to fly commercially, this middle-class growth could be another massive catalyst for China's air industry. Plus, China is an even larger country than the United States by territory size, meaning its citizens are reliant on air travel to get across the country, much like Americans. Shanghai and Beijing, for example, are over 800 miles away from each other. That's farther than the distance between New York and Chicago. It's no wonder the IATA forecasts China's air passengers will double over the next 18 years. This gives investors the rare opportunity to get in early on an industry with the potential to more than double in size, all before the mainstream catches on and floods into these airlines stocks. And one of the big winners could be this Chinese carrier. It's one of China's major airlines and dominates the domestic air travel sector in China. This airline's sales have grown every year for a decade, and it just booked a record profit in 2017. Wall Street hasn't caught on to how lucrative this company is yet. But its loss can be your gain. This stock has a perfect VQScore, meaning it's a breakout candidate according to our proprietary algorithm.